it's new years day here in thailand - new years eve still for yall. we're always in the future. Tok and i have had some marvelous adventures and a lot of ordinary daily life here in the land of perpetual summer. obviously i've spent more time doing things than typing them out. we went out for dinner at a nice karaoke restaurant last night. Mama is still sick in hospital with some bug, so Tok, Teri, and Toks good friend Malee and i had an excellent dinner. There was no place with a newyears "countdown" so Tok took Teri and me back home, and she went back to stay at the hospital with MaMa. The neighbors were setting off fireworks and had their stereo cranked up to 10 playing karaoke songs. This went on ALL night. they didn't' shut down until 9:00am this morning. so aside from lonely sleep because Tok wasn't there, i had boom boom boom BANG! dreams. I woke up to the usual rooster choir, stereo still blasting Midi music and people singing sorta close to the song, and the zooming traffic on the big road, sun blazing thru the east window. and there is no place else i'd rather be. for all of you, a good year. i've received a few emails asking "whats happening over there? where are the postings" i have to admit, posting about life here, reminds me of life there, and i'd rather just be here. but, my postings are as much for me as for yall, as it keeps a record of my experiences and travels. so here's the ketchup, and i'll post some of the details accounts on the website and send links to them. my 23 hour layover in korea was wonderful. i like korea. even though i've only seen a small part of Seoul, the vibe there is very pleasant. but it was cold! i spent the night in the jjimjillbang, which was amazing. if you fly korean air to asia, look for the schedule that gives you that 23 hour layover. you can exit the airport, bus or train into the city, and have a free day in korea. arrived in bangkok late in the evening and couldn't find Tok, my mobile phone didn't work, so i had to figure out the pay-phones. finally discovered you have to dial a leading "0" to get through. she was waiting way down at the other end of the terminal. i'd delayed my departure a week to let the flood waters go down some, and she had a room at our favorite hotel all booked and ready to go. the sky-train boards right at the airport - unlike the light rail in seattle, which boards a thousand yards away, terrorists you know, can't have them taking the train right to the airport- we have to make them walk in like the rest of us. the sky train takes us to victory monument station, where it's a short walk to Hotel 99.
we spend a couple of days in bangkok. picking up things we can't get up north. bangkok shopping is an assault on the senses. there is so much stuff, so many little shops and kiosks. strange thing is, if you are just walking around looking at everything you will find all sorts of things you didn't know you needed. but if you go looking for a specific thing - like a 14V DC power adapter, you'll go crazy cause nobody has one. there were piles of sandbags everywhere, and many of the shops had sudden cinder block dams built around the entrances. Tok told me that at the height of things, people were charging as high as 400 baht (12.97$) per sandbag. normal price about 50 cents. there's probably whole beaches with no sand on them anymore. my favorite guitar shop had nothing on the racks. the owner moved everything upstairs in case the water came as far as his shop, luckily it didn't. we took the bus from Mochit station home to Lom Sak. along the way, just outside of bangkok, we could see there were large areas still underwater. acres and acres of factories and homes flooded. fortunately, most of the major roads in thailand are built on raised berms, so traffic still moves, but there were a couple of times the bus had to cross sections a foot deep in water. from the time we got home, we've been going going going, like little energizer bunnies. went to the tamarind factory, went to a singing contest that Toks daughter danced in, visiting people, getting supplies, shopping for food and things i need, getting the car fixed, getting supplies for the construction workers. hardly any time sitting on the porch reading my book and sipping espresso. my wife had saved up some money, put it down on a toyota pickup truck, and contracted to have the dirt area under our bedroom house paved with concrete. the people who sold her the truck changed their minds and wanted the rest of the money at once, so they could buy another car, so we ran around trying to find another truck - Tok finally made arrangements with another family in the village to pay off the first people and carry the loan for her. on and on and on. only quieted down in the last couple of days. i just love it here. it's warm and sunny everyday. it's the dry season now, so no rain for a couple months and cool at night. last night, i took a shower in my outside shower, and looked up and enjoyed the total eclipse of the moon, the bright point of jupiter, the shadow of palm trees against the night sky. sublime. slumber party at our house last night. my wife's daughter and her friends are in a dancing show this morning. everybody was up *before* dawn so Tok could do their make-up. landed at the airport in bangkok a few days ago and havn't stopped moving since. went everywhere shopping and looking in BKK, took the bus home to Dong Khwang, our village. lots of changes around here - new houses here and there, trees and bushes have grown up, my sweet wife has been busy making improvements to the house and property. you know how there's always something you forget to bring when you travel? i forgot to pack the netbook that i bought specifically for traveling. it's small, light, easy to transport and it works. the two notebook computers we have at the house here are very old, slow and generally messed up. only got this one working late this afternoon... is why i haven't been posting anything since i got back. but it's wonderful to be here, its certainly a thrill, waking up at 5:30 am to the howling roosters next door, the blazing sun rise that turns the bedroom house into an easy-bake oven within an hour; cars, trucks and motorbikes roaring by intermittently on the big road out front, people talking in words i can barely make out and can't understand, the wack wack wack sound of someone pulverizing chilies and herbs in a stone mortar, and oh yeah, when you are at the edge of the road wanting to cross, look the other way, cause cars are driven on the left side. and i'm happy as can be to be home. more... when i get the computer crap worked out. Thaikarl 1111223 - greetings from Korea! At long last, the adventure continues. Only 2 degrees here. Just like Seattle but its not raining! I'm off to find a Jjimjilbang- Korean bathhouse to shower, soak, and sleep. 23 hour layover. my wife sent me some photos of the construction of a giant budda. they are building it beside the road somewhere in Petchaboon - which is good sized town 25 minutes away from our house. Petchaboon is the seat of our province of... Petchaboon. 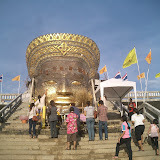 as you can see, while the head of the statue is on the ground, many people have come to apply little squares of gold leaf to the face. one of the many ways to show respect and make merit. by giving away something precious - gold - you are making a bit of merit for your life. I hope i can get home for the dedication ceremony. that will be an event! click the image below to goto the gallery of photos. i received some very nice, concerned comments on my last post. and several kind offers from friends to donate their own blood for mama. don't think the blood would survive the post getting to thailand however. i sometimes feel like i'm viewing the world of thailand with fogged glasses and earplugs in. i can't quite see what's going on clearly, and what i hear is muffled. i have to try to figure out what is going on. and i realize that my understanding is filtered through my own experience. mama's condition has been known for quite a while. in the past year, as her kidney slowly wears out, it has slowed her down and caused her problems in over-all well-being. she is normally a self-guided busy machine. she cooks, processes output from the fields, makes things (she knotted a three foot fishing net by hand), tends to the plants, chops wood, removes the weeds, visits with friends, and relaxes in between. i asked tok what mama wants to do about her failing health. they discussed it, and faced with the hassle and complication of home dialysis, mama decided that she didn't' want to mess with that. she's around 77 years old and has had a full life. she would rather spend her savings to have a decent funeral than spend it on extra-ordinary medicine that would prolong the length of her life, but not the quality of her life. the funeral is preparation to go from this life to the next life. not to some heaven or infinite after-life, but to the next incarnation in this world. and during that transition you meet your ancestors and the spirits that surround us. so it is more important to her to have a good send-off than to live her a little longer and have a poor presentation to the ancestors. she is a person that i love and care for, but you know we have never had a conversation? she speaks no english except for "good morning" any interaction with mama and i has to be translated thru tok, and i get the readers-digest-condensed version. i'll ask a question, like "how many relatives does mama have?" tok and mama will talk for 10 minutes, and tok will answer me "many". that's it. life without her will be quite different. tok will have to maintain the house and take care of her daughter all by herself when mama isn't there to help. i'm fairly useless with the house stuff. i can't cook - and don't really care to learn how, i can clean but i'm worse than a fifteen year old, i don't know much about caring for plants, except for dumping water on them, and i sure can't knot a fishing net. my job is to "bring home the bacon" or in this case "bring home the baht" until i can figure out a way to do that at home, i have to do that from here... which doesn't help take care of the household up-keep. tok did locate some blood, and she's got a donor list going so next month, or when ever it's needed she won't have to do so much running around. the hospital may have better supplies on hand by then also. the notable thing, which was the real subject of my last post, was the idea of running around on your own to find a donor. i've only heard of that here in the states with people who have very rare blood types. thailands medical system is quite extensive, but there are some areas lacking of course. and they pay a tiny fraction of the price we pay, for the same or better general health care. the weather in seattle is miserable right now. (whine, snivel, whine whine) low thirties, windy, rain. oh, would i much rather be in the tropics. 77 degrees F and partly cloudy in bangkok right now. this new year feels alot like last year. well, today feels a lot like a few days ago when it was the last year. Smack-a-life changes in the last month, but i'll get to that later. tok got in mind to get some business going. she was looking into a few options and finally decided to sell rumbutan fruit. so she took her savings, had a stand built in front of the house by the big road, bought a stock of fruit and went for it. new years is a four day holiday for thai people. many people come up our way to go the mountains where there are some sights and a lot of resorts. she has been somewhere up in the mountains near where we live, selling fruit, and from what she told me today, she's doing quite well. when she first brought it up to me, i ran thru the standard business modeling - profit/loss, cost of goods, sales, return on investment, etc etc etc. that went right past her. i gave up all that scientific stuff and just told her i'd do anything to help if i can. i already posted a short one about it on the blog: http://www.thaicountrylife.com/2010/12/toks-fruit-stand.html there's a photo there. hope yall are well and have a good year.